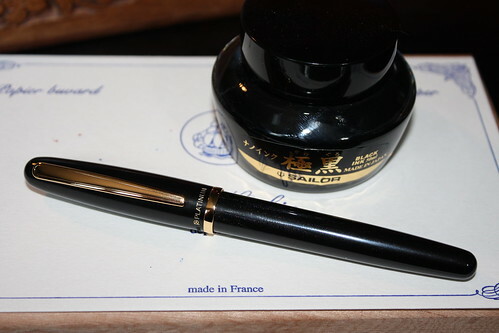 If you begin to read fountain pen reviews, and collector’s sites, you’ll soon see a fair bit about starter or beginner pens, as if they were some sort of gateway drug to the harder, and more expensive, Montblanc or Nakaya. And who am I to judge the analogy? It may well ring true for a lot of people. But I shall write about how this has worked out for me. 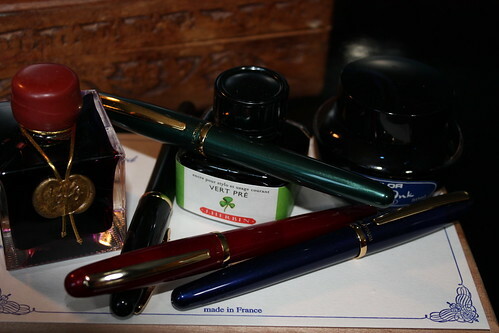 I have tried a number of so-called starter pens, the Platinum Preppy for example, and ranges from Jinhao, Pilot (78Gs, Kakunos, Metropolitans), Noodler’s, Kaweco, and Lamy—they all make products that come in under $40, some under $30 Canadian. And I’ll be honest, if any one of them had been my first exposure to a fountain pen, you wouldn’t be reading any of this now. Are you still here? Good. The mistake I feel some people make, is in saying beginner pen instead of cheap pen. And there’s a difference, a Balancing act if you will (did you notice what i did there?). A beginner, or starter pen, needs to impress; it needs to look good; feel nice in the hand; be reliable; easy to write with; easy to fill, and make you want more. Have you read my review of the Platinum Plaisir? 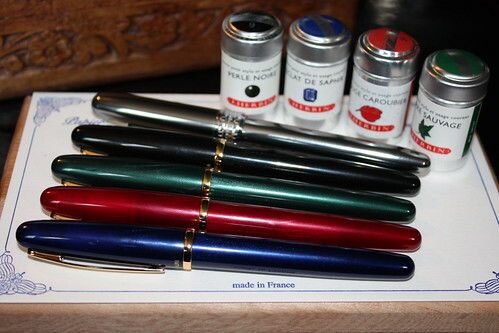 The Plaisir is a pen commonly held up as a good starter; well, if that had been my starter, and I didn’t know anything about how the tines should be arranged in relation to the ink feed and so on… I would probably have thrown it in the garbage, and be carrying a cheap ballpoint instead. But then, I suppose the Cross twins weren’t much better really, and here I am regardless. But if I had purchased a Platinum Balance… now that would have been a different scenario altogether. The Balance pulls off that, er, balancing act between quality and price in a very successful manner. Currently available in black, blue, green and red, these pens are slightly more expensive than the absolute lowest-end of the fountain pen product ranges, but are still less than $70 Canadian (including taxes). They have a good quality, plastic construction, with a simple gold-colored ring between the barrel and section, at the base of the cap, and for the clip. Nibs are a gold-colored steel, and the cap contains Platinum’s excellent slip and seal technology, to stop them from drying out. The Platinum Balance range… and a Plaisir, not sure how that crept in there. 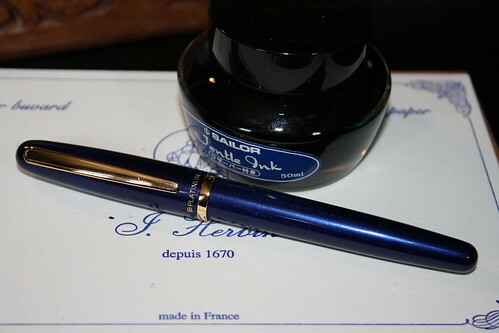 After starting off with the Platinum-supplied blue cartridge, I loaded the blue pen with J. Herbin’s Eclat de Saphir. That’s a nice color, but after a while I found I preferred the deeper tone of Sailor’s Jentle Blue; and I think it’s a better match for the pen too. 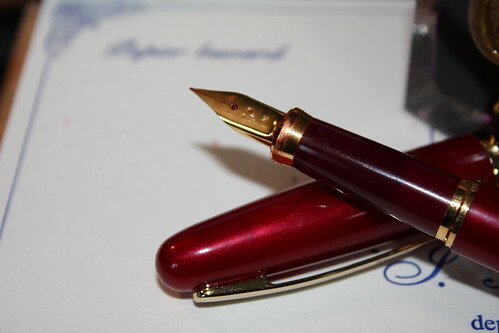 Both the red and the black pens had the Platinum fine steel nib. Even in the black, the finish on the Platinum Balance has a light, glittery sheen, that catches light and sparkles. Now, my whole purpose in sourcing the four pens from each of the two different suppliers was an attempt at getting a random sample of these pens. I was hoping that, in buying from the two shops, I might get pens from different batches, and a broader, more generalized idea of quality. The Balance is actually a slightly larger pen than it’s higher-quality cousin the Century 3776, by almost a whole centimeter (a little less than half an inch), from nib tip to the end of the bottom finial. Despite its slightly greater length, it’s not a heavy pen, coming in at about 6g (02.oz) lighter than the 3776. It takes both cartridges and a converter (Platinum’s own), but isn’t supplied with a converter. It also accepts the Platinum cartridges adapters, which I have mentioned on this blog before, and allow you to use European standard size ink cartridges. 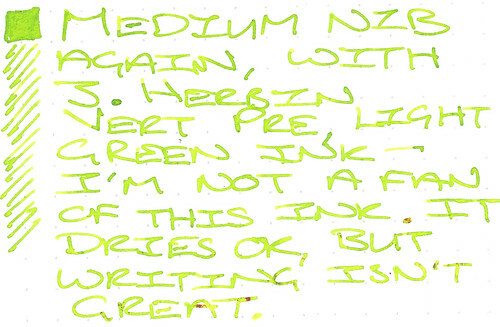 This is the medium nib from Take Note… I inked this up in Starbucks before I even drove home. Each of these pens was exceptional straight out of the box. Now that is what I would want in a starter pen. 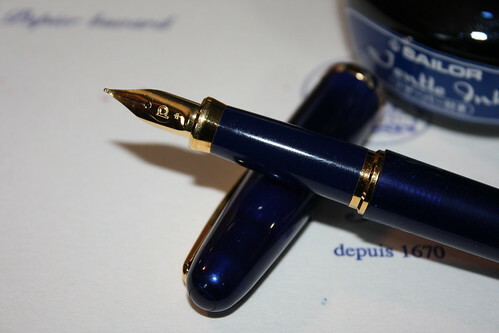 Nobody who has limited or no experience of fountain pens is going to look beyond their first few minutes with a pen, and these give a welcome that you just don’t expect for less than a couple of hundred bucks. And in my experience, only the TWSBI range provides comparable performance for a similar price point, but I’ll talk about TWSBI at a later date. These pens wrote flawlessy, and each one performed just as the last, maintaining a great consistency between pens. 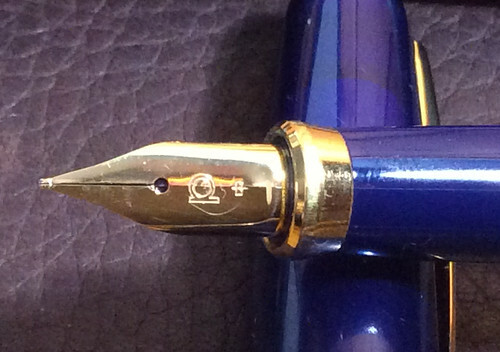 Each nib gave just a hint of feedback; the fine nibs just a fraction more than the medium. I love them, these were absolutely perfect for me. Writing sample from a Platinum Balance, medium steel nib, using Platinum blue ink cartridge (supplied), on Rhodia Dotpad 80gsm paper. This was the medium nib on a Rhodia Dotpad, with the Platinum-supplied blue ink cartridge… in Starbucks on the 401 coming out of Toronto, because I just couldn’t wait. 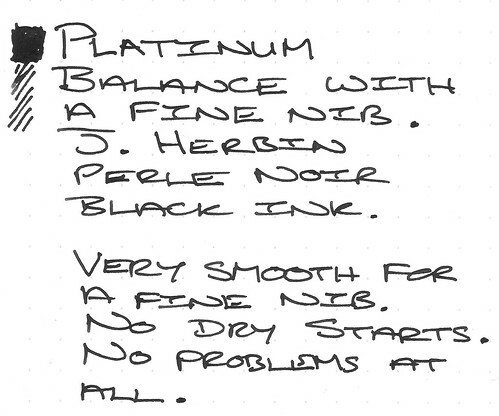 I do like the Platinum ink, it has a nice tone, pretty quick to dry, and flows nicely. I finally managed to get home before filling the rest of the Balance brood. 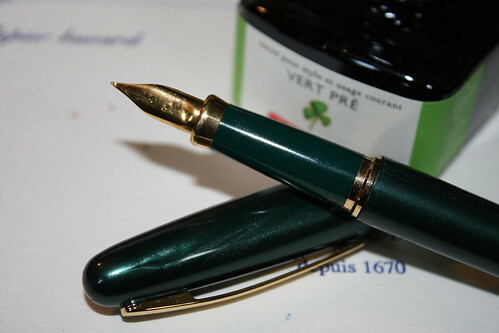 The next was the second medium nib, with J. Herbin’s Vert Pre. Writing sample from a Platinum Balance, medium steel nib, using J. Herbin Vert Pre (green) ink cartridge, on Rhodia Dotpad 80gsm paper. 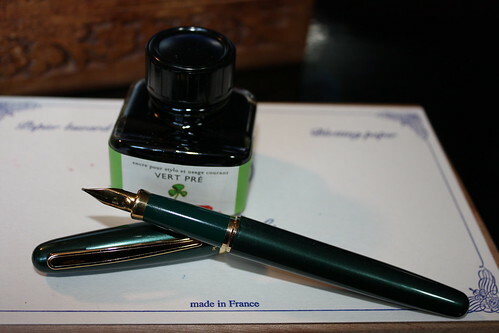 I’m still on the fence with the Vert Pre; it’s a nice ink, flows well, dries OK, but it’s very light when you write with it, and in some lighting, I have to look carefully to see if I have even made a line. Still, it dries OK. I just may have to try something a bit darker next time. The pen however, that behaves beautifully; it lays a consistent, smooth line, from first stroke (no hard starts), to rapid-fire notes… even if the green isn’t what you would usually choose for note-taking. Writing sample from a Platinum Balance, fine steel nib, using J. Herbin Perle Noire (black) ink cartridge, on Rhodia Dotpad 80gsm paper. This is the first fine nib I have ever actually owned. I have written with a few, borrowed more, but never parted with my own cash for one. This pen, and this nib, make me wish I’d bought one long ago. I find myself looking for excuses to write with these pens. 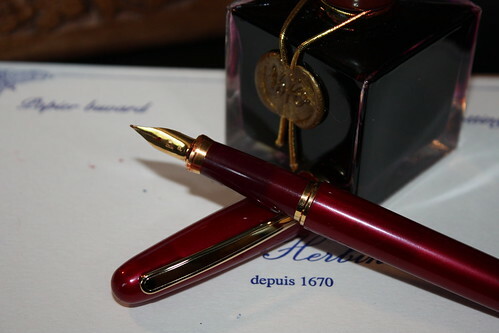 And lastly, if I have a favorite amongst the four Balances, then it’s the combination of the sparkly red barrel, with the J. Herbin, 1670 Anniversary Rouge Hematite ink. The combination just seems absolutely perfect. 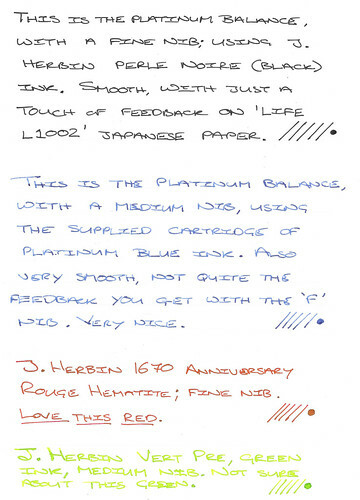 Writing sample from a Platinum Balance, fine steel nib, using J. Herbin 1670 Anniversary Rouge Hematite (red) ink, on Rhodia Dotpad 80gsm paper. It makes me wish I had opted for the red in a medium, rather than the green… just to show off the ink a bit more. Still, at this price, I can afford to expand a little. If you’re looking for an affordable fountain pen, that performs like it costs three times the price or more, then this is the pen; look no further. Done. 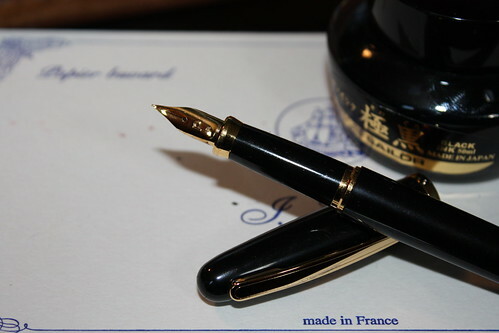 If you’re looking to buy somebody a first fountain pen that’s going to impress their socks off, and eventually lead to them saying things like, “I’m saving for my first Nakaya…” then you have also found your mark.